Is MyFreeLotteryPool a Scam or Legit? Read 4 Reviews! MyFreeLotteryPool Exposed — What Does Captain Dano Offer? Oh my goodness – clicking onto myfreelotterypool.com aka freelotterypool.com was like walking into a rave! There are things flashing, popping and dancing around. It took a few moments to figure out where to start. Welcome to the world of Daniel Bader “aka Captain Dano”. The big thing is – it does appear to be an online lottery pool site that is free. But is it really? Captain Dano (you can meet him in his YouTube video) puts together a bunch of free lottery pools for the US Powerball and Mega Millions and California’s SuperLotto. It’s a little gray on how many shares are in each pool, but it appears players have opportunities to join a bunch of them – more on that shortly. To get into the games, click on “Join Us” and register. They do not ask for any credit card details! This is free play. Okay, most of us know that most of these free lottery sites usually this means a flood of spam and other advertising into your mailbox. My Free Lottery Pool – How Do They Do It? According to Captain Dano, there is no spam, no flooding your Inbox and/or this is simply a chance to win something for free. So how do they pay for the lottery tickets for the pools? Advertising – and that is very clear from their site. That’s one of the issues in figuring out what to click on. Toyota is just one of the advertisers here with links to their “Buckle Up” program. I got lost a while at the Family Feud site at “Games and Stuff”. There is a Daily Horoscope page and seriously, there is a lot happening here – besides being able to play in lottery pools for free. There is only one account per member and your profile must be accurate. You must register with a gmail or yahoo address (not sure why but their rules). The tickets in the pools are paid for by myfreelotterypool.com’s advertisers. It seems the lottery pools add up to about 300 tickets per month and players can request a copy of their numbers. This site does get a little confusing in their FAQs with more and more ways to play. Firstly, once you register, you can either use the Quick Function or pick your own 6 numbers. This is added to the “Predictions Roster” and “Official Pool Roster”. After each draw, your numbers are ranked. If you’ve won anything, you are awarded “winners’ points” which will be added to your account. You can choose to bet against Captain Dano with whoever is closest gets the reward points. It looks like reward points can be used to get more tickets in more pools – we think. Then there is “Fortune Cookies” that get more reward points or entries into pools, “Tell A Friend” and “Loyalty Points”. Bouncing around the site, we wondered what the heck is “Go First Cabin”. 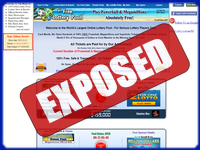 As a First Cabin Member at myfreelotterypool.com, you are automatically entered into a heap of lottery pools. There are two ways to join – either purchase something from their First Cabin Clothing Boutique or link into Wintrillions or Congolotto and receive a free membership. Well, on the second option you have to email Captain Dano to check if you qualify. The terms and conditions are pretty short and sweet though it did take a couple of reads to figure out exactly what they are saying. The first thing you should know is My Free Lottery “reserves the right” to keep all winnings that aren’t the jackpot. It also keeps 10% of “net” winnings on jackpots and “reserves” up to 200 shares in all pools. Anyone who is holding a second or third prize tier for any of the pools is entered into the Admiral’s Club. Myfreelotterypool.com takes 25% of those prizes and reinvests it into tickets in this club. They keep the rest. Don’t look for live chat, a phone number, snail mail or email address. The only way to contact Captain Dano at myfreelotterypool.com is through their online form. This is a serious advertising site that does look like a legit place to play in free lottery pools. We’re not sure how much you are going to win, but then again, it’s free so who cares! Winning is winning. And it appears that playing doesn’t mean your Inbox is going to get flooded with spam and other advertising. Myfreelotterypool.com gets a thumbs up if for only for the rave factor. I’m not sure if you (or I) are actually going to win something, but then again it is free! I’m not sure if anyone will ever be able to add up the different ways to play, but then again, maybe that is half the fun. You are great indeed! More grease on your elbows. Free but an awful waste of time. I’m really glad that I got kicked out without notice. No bad feelings because this is compliant with Captain Dano’s rules! I had an unpleasant experience with My freelotterypool.com promoted by Dan BaderAka Capt. Dano, a few years ago. 4 members of my household joined this site and were playing for themselves, as the rules allowed to do so. About a year later I was told this was not allowed so I asked the other 3 members to stop playing. Only I played. I earned points playing the ‘slots’ on this site. There was no limit in playing The Slots. I earned enough points and redeemed them to become a ‘First Class Cabin’ member with a validity of 1 year. On expiry, I renewed my FCC membership for another 1 year using the points earned from the Slots game. Then, all of a sudden my membership was terminated. I enquired with Capt. Dano. I was told the membership can be terminated without any reason and ‘don’t expect to sit in your armchair (i.e. playing slots) and become a First Class Member. Then I understood that this site wanted me to purchase/buy a First Class Membership and not redeem the points earned by playing Slots, though it said it was allowed. 2. Recently I had a conversation with Capt. Dano on Twitter where players from India are not allowed to play free. They have to purchase First Class Membership at a fee. So I told Capt. Dano that this site is not ‘free’ after all, as claimed by him. He tells me to ‘go away’. I replied ‘truth hurts’. A free lottery with no spam is hard to come by. But the only time you’ll win is getting that mega jackpot. The share ratio seems fair so that does mean you will get a good piece of the pie. I’m still a little suspicious about the no spam thing but I’m going to give it a try.